Each winter brings forth more imperial stouts for Australian beer drinkers to wallow in, ensuring long established classics like Red Hill Brewery's Imperial Stout, Moo Brew's annual double-header and Nail's iconic Clout Stout have plenty of company. And, as with seemingly all beer styles these days, brewers are becoming increasingly experimental with their big stouts, whether that's ageing on oak, blending different versions or adding all manner of adjuncts to the mix. Boatrocker has begun a process of sending barrels used for its annual Ramjet back to Starward to make whisky in again (before, ultimately, sending them back so a Ramjet Ramjet can be brewed). Stockade took its trophy-winning imperial stout Old Money, loaded it with maple and ended up with the GABS 2017 People's Choice title. Murray's has released three imperial stouts each winter on several occasions (this year it's old favourites Heart of Darkness, Wild Thing and new release Wild Thing Vanilla). 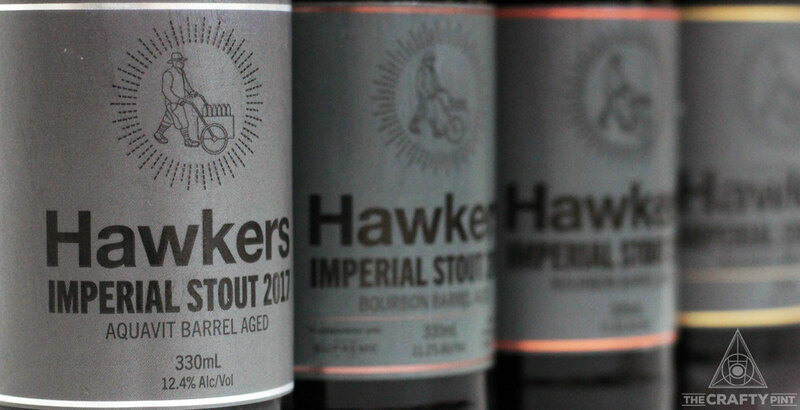 And now Hawkers Beer has nudged things a little further in launching not one, not two, but four different barrel aged versions of its 2017 Imperial Stout at the same time. Three were aged in Willetts Kentucky Bourbon barrels, of which one has been released straight, one blended with Coffee Supreme coffee and one with maple and smoked figs. The fourth has been aged in Aquavit spirit barrels sourced from Scandinavia and it's the last of these that has brewery co-founder and CEO Mazen Hajjar most excited. "I've been a big fan of Scandinavia for a long time," he says. "I spent a lot of time there and, at 961 Beer [the brewery he founded in Lebanon], my first partner was Danish so I was quite aware of Aquavit." The 2017 lineup of barrel aged imperial stouts from Hawkers. The spirit is traditionally flavoured with herbs and spices, some of which echo Middle Eastern practices where, for example, cardamom is added to coffee. The barrels obtained by Hawkers are from Norwegian distiller Linie, which sends its barrels across the equator twice before bottling, the idea being that the movement and fluctuating temperatures extract more flavour and accelerate maturation. 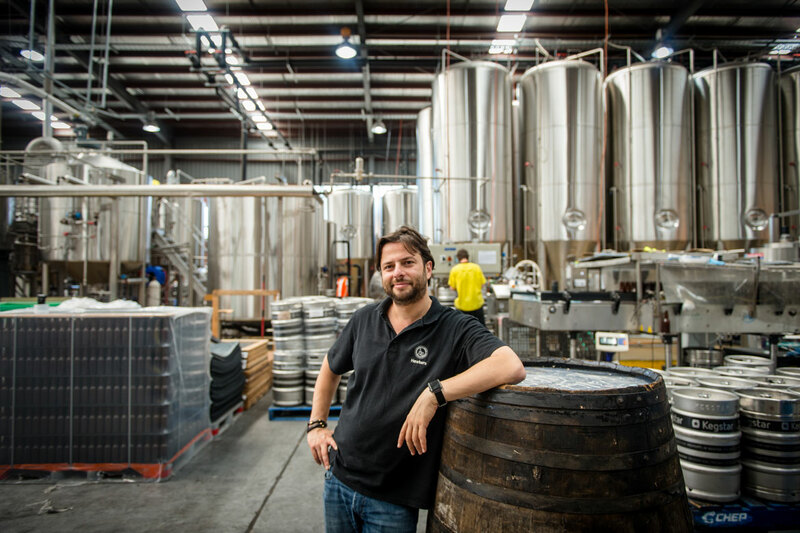 Mazen believes the beer aged inside them is the first in Australia to spend time in such barrels and says the intention is to bring a new dimension to the world of locally brewed imperial stouts. "We are used to the vanilla, marshmallow and oaky characters, but what about caraway, anise and cardamom?" he says, adding that the plan is to start ageing Belgian style beers within the barrels too. As things stand, the Hawkers barrel program sits at 110 barrels with the intention of taking that number to 500 in the next couple of years – then beyond and into four figures. It would put them in a similar space to Boatrocker and White Rabbit, who both opened sizeable barrel rooms in 2015. Within the existing barrels – all bourbon and Aquavit as things stand – you'll currently find beers including a saison, a Scotch ale, a barley wine, a stout and a collaboration that has Mazen (pictured below) sounding giddy: a wheat wine brewed earlier this year with Larry Sidor of Crux Fermentation in Oregon. "Those styles [wheat and barley wines] traditionally don't get the geeks excited. That's the kind of education we're trying to put through. "We're trying to push and change things up a bit and do things slightly differently," says Mazen of a process within the brewery he describes as an art form. "The aim eventually is to make [barrel aged beers] a bit more approachable and affordable in Australia. "We will continue to play around with different things and will be launching a barrel day at the brewery next year." While that remains months away, if you're keen to see where the brewers and their barrels are at right now, the four imperial stouts are making their way around Australia now. You can read what we made of them here. 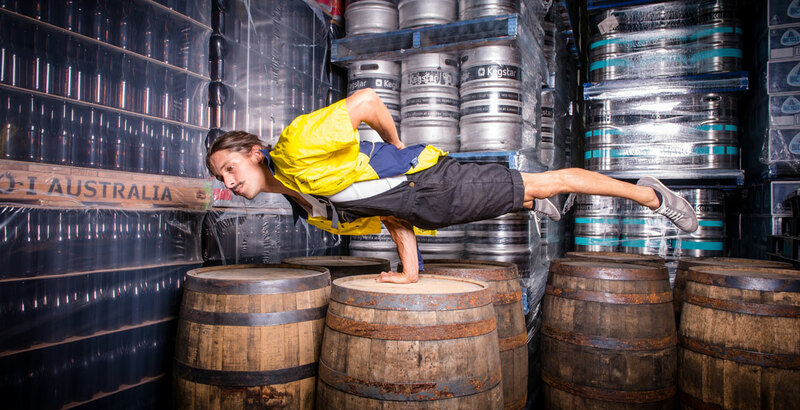 Supplied photo at top taken in advance of Hawkers' 2017 Good Beer Week event for which they turned the brewery into a circus performance space. Don't forget you can vote for the imperial stouts (not barrel aged) we'll feature in our next blind tasting.